You can copy hundreds of items at once. The important thing is that lists are either in table form or are tab-separated. Copy from a table in word, an excel spreadsheet, a quizlet or quia word list etc etc. Click on the "Quick Input" tab on the TextMatch edit screen to open the Quick Input screen. Paste your list into the white box. Ensure that the list is correctly formatted. (It should be, if it's copied from sources such as those featured above.) Sometimes it can help to paste the list into Word first, then copy this list into the Quick Input screen. If your list is already separated using anonther separator (e.g. = : , - >) you can easily convert the list into the correct format. If your list is on alternate lines (e.g. English on 1 line, French on the next etc.) you can click a button to format it correctly. You have the option to switch the left and right columns at this point (or you can switch items after importing them). Click on the button to check the formatting before inserting the data. If there are any problems, you'll see messages telling you what you need to put right. If all is well, the green message will appear at the bottom of the screen, and you can click on "Insert Data" to import the list into Text Match. In the example above, 33 items have been imported. But you can use this procedure to import hundreds of matching items in one go. If you want to add another list to your file from a different source, simply click on "Quick Input" again, paste in the new list and follow the steps above. The new list will be added to the bottom of your existing matching items. 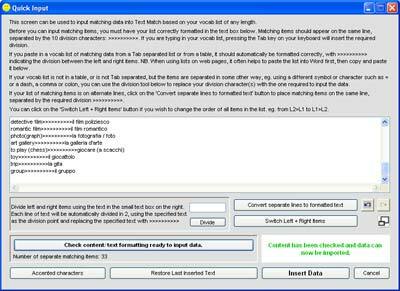 Some of the Text Match exercises have a limited number of items on the screen at any one time (typically up to 16, although you can change the number that appear). TaskMagic will select randomly from the available list each time you start these exercises, so each time you restart you'll be working with a different set of lexical items. Other Text Match exercises run through the entire sequence in random order, one lexical item at a time, until you get to the end of the list (or until you run out of lives ;-). Again, each time you restart, you'll be working with a different sequence of lexical items. 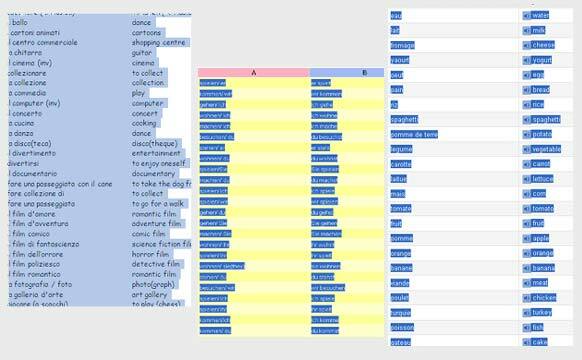 See this example of a Text Match file with over 1500 English-French lexical items (based on the GCSE vocab list). Go to http://www.mdlsoft.co.uk for lots more info about TaskMagic3.